Fnatic, known for their eSports teams, has just added a few gaming peripherals to their armory for gamers. 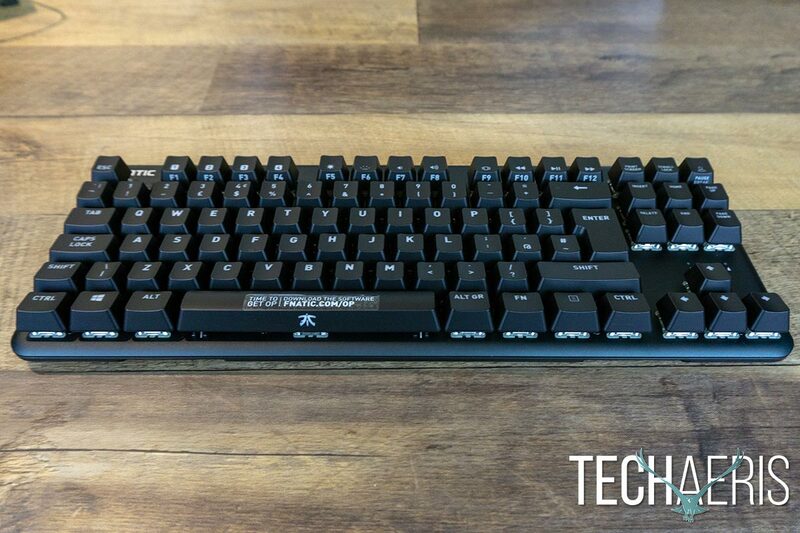 Our Fnatic miniSTREAK and STREAK review takes a look at two of these new peripherals: mechanical gaming keyboards in a tenkeyless and full-size format featuring your choice of Cherry MX switches. 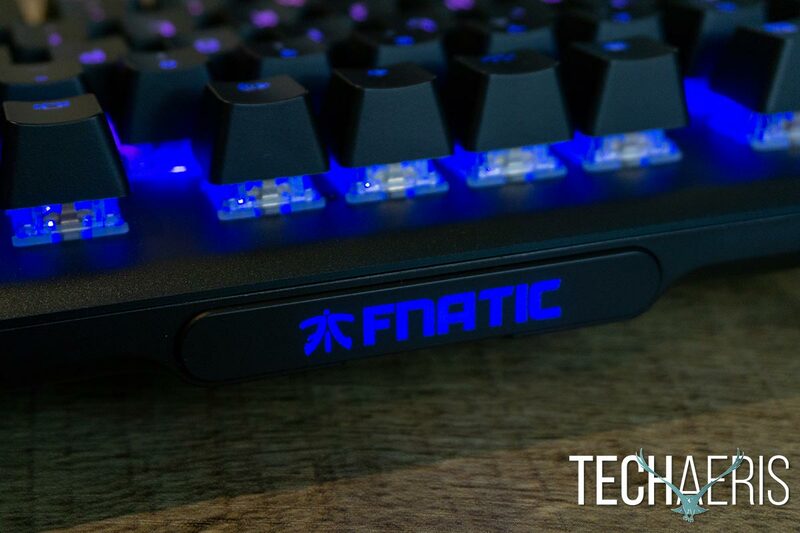 Read on to see how these keyboards developed with feedback from Fnatic’s eSports players perform! 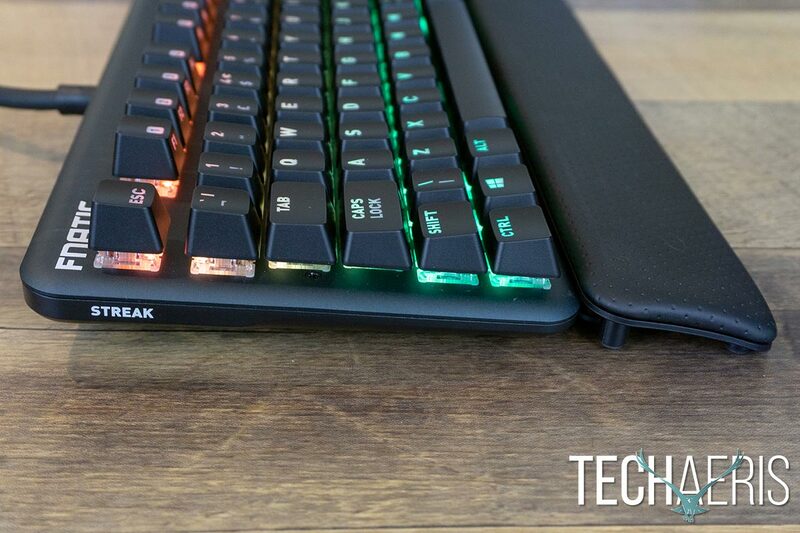 NOTE: normally we don’t double up on products in reviews but given the similarities between the STREAK and miniSTREAK keyboards, it makes sense in this case. As a result, the rating will be a bit of a combined rating when it comes to things like design and price/value. What’s in the box with the Fnatic STREAK. What’s in the box with the Fnatic miniSTREAK. 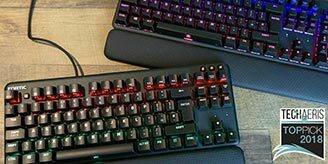 Mechanical gaming keyboards run the gamut when it comes to design from the more traditional looking keyboards to the heavier-duty aluminum style. The Fnatic STREAK and miniSTREAK fall somewhere in between with a super-slim metal build with rounded corners and edges. At only 28mm thin (at its thinnest point), the STREAK comes in at 962g while the miniSTREAK weighs only 702g, making them fairly light as well. The Fnatic Gear Generation 2 mechanical keyboards sport the floating key caps style and are finished with an anodized metal top plate. While our review unit was a darker grey/black finish, the final production units sport a black top plate finish. 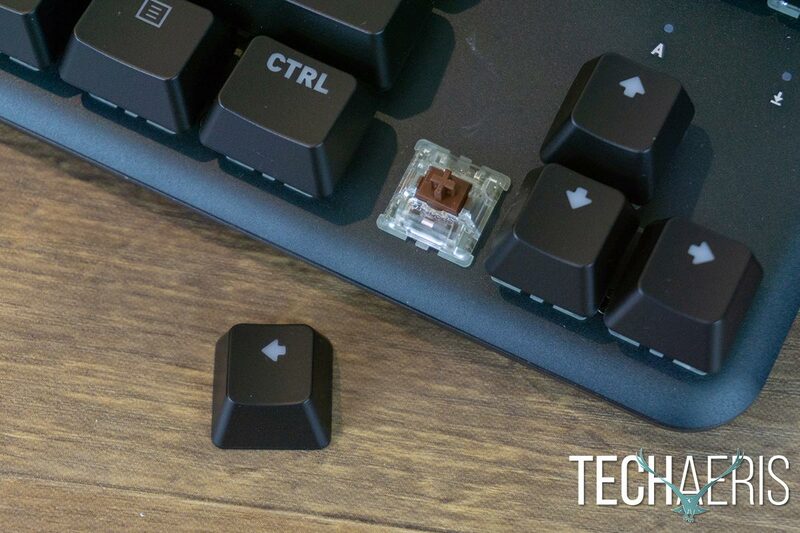 The Fnatic miniSTREAK (pictured) and STREAK utilize the floating keycap style. The STREAK and miniSTREAK keyboards both feature your standard six-row layout, with the STREAK also including a full-sized number pad. Both keyboards feature the Fnatic logo printed above the Esc key and a Fn Lock button between the Esc and F1 key on the left-hand side of the keyboard. Both keyboards also have an interesting placement with the LED indicators for the Numlock (STREAK only), Caps Lock, and Scroll Lock functions located above the arrow keys towards the left of the keyboard. The STREAK has a microphone mute, Competition Mode, and speaker mute button along with a volume rocker above the number pad. The Fnatic STREAK with included PU leather wrist pad. The miniSTREAK, on the other hand, has the same three buttons sans volume rocker located above the Print Screen/Scroll Lock/Pause keys. These buttons, along with the Fn Lock button illuminate when activated. As far as additional key functionality on the STREAK, the F1-F6 keys double as programmable keys, F7 & F8 allow you to control the lighting schemes, F9 doubles as a Windows window preview key, and F10-F12 are your media playback control keys. The miniSTREAK is pretty similar with the exception of only having the F1-F4 keys being programmable out of the box, the F5 & F6 keys for lighting control, and the addition of volume down and up on the F7 & F8 keys due to the lack of the volume rocker. Pretty much the only issue I have with the keyboard layout is the half-sized Shift key on the left hand side. It took some time, and eventually, I did get used to it but on occasion, I still end up with a \ instead of a capital letter. The Fnatic miniSTREAK tenkeyless mechanical gaming keyboard. 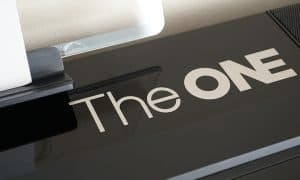 The STREAK wordmark is also printed on the left and right sides of each keyboard and a pair of receptacles for the included wrist rest plate to snap in to. 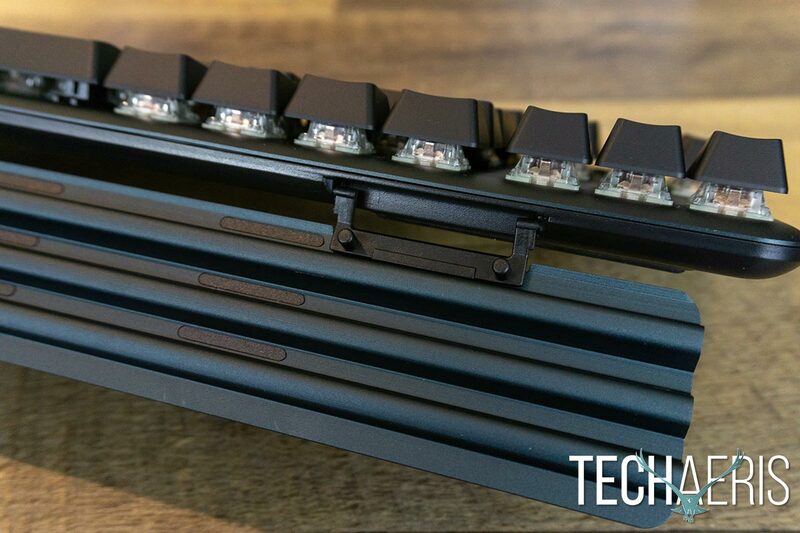 The wrist rest plate is a ridged metal piece with three ridges. These ridges allow you to place the PU leather wrist rest — which is held in place by magnets — in three different positions. The first butts the wrist rest right against the keyboard, the middle about 1/2″ away, and the furthest 1″ away from the front edge of the keyboard. Given that the wrist rest is only about 2 1/4″ wide, this setup allows for optimal placement. With both keyboards, I found the middle placement the most comfortable — not to mention one of the more comfortable wrist rests I’ve used recently. The wrist rest base snaps into the front of the miniSTREAK and STREAK keyboards. On the back of the keyboard is where things also differ slightly. 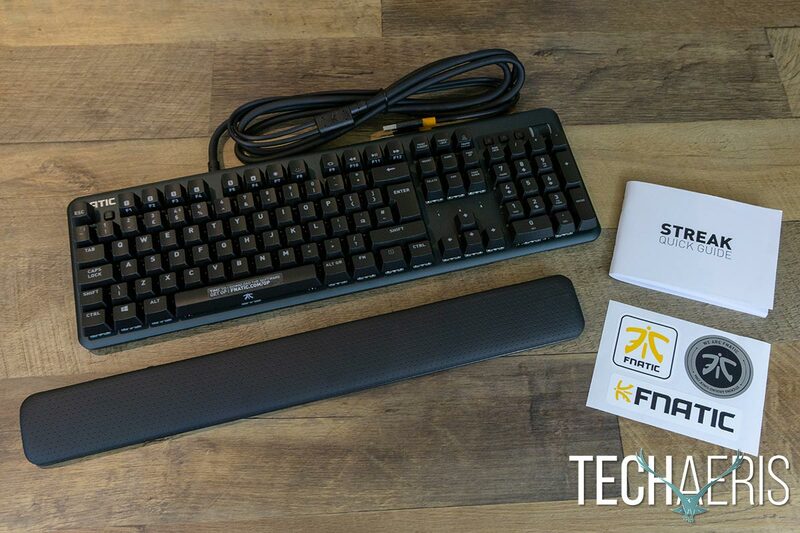 Both keyboards have a removable magnetic signature plate, which ships with the Fnatic logo on it — customizable plates will be available in a few months. The keyboards have a removable nameplate which will be customizable in the coming months. 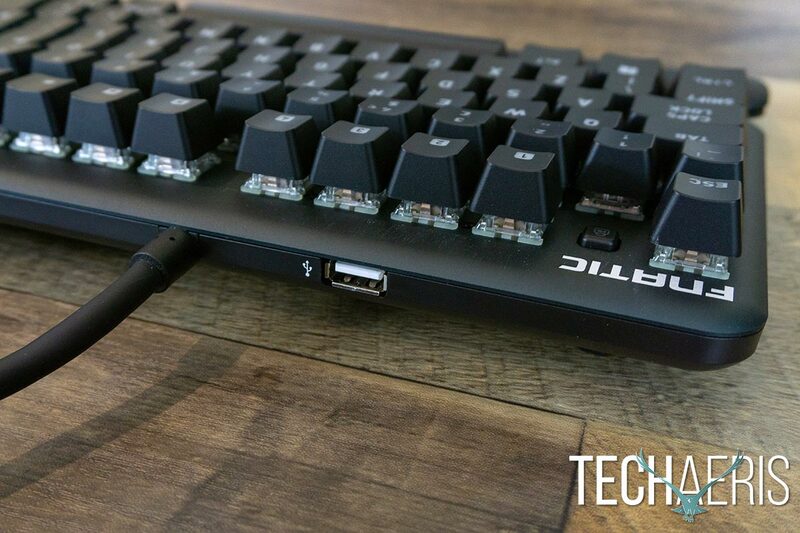 The STREAK has a hardwired USB cable coming out from the left side (when the keyboard is in use) and a USB passthrough port to the left of that just above the F2 and F3 keys. The USB cable has two ends on it, one for keyboard functionality and the other to allow for the USB passthrough port to be used. 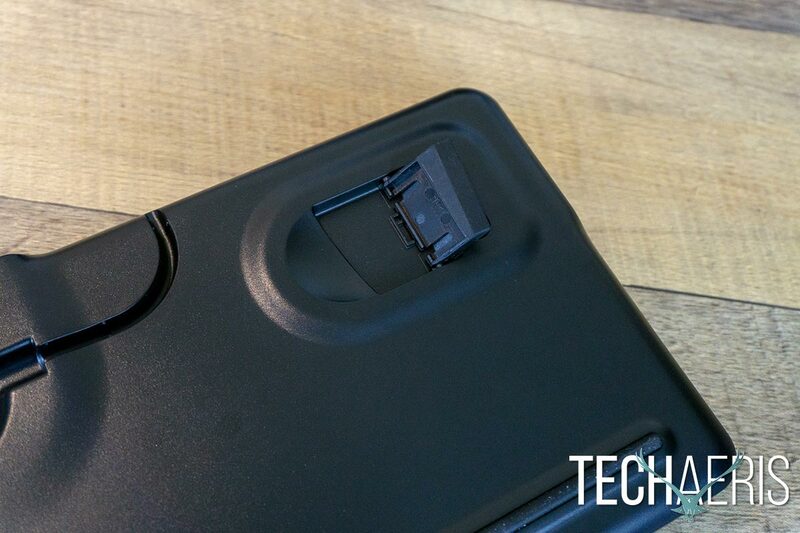 The miniSTREAK, on the other hand, has a notch where the removable USB-C to USB-A cable comes out from the underside of the keyboard. The Fnatic STREAK includes a USB passthrough port. 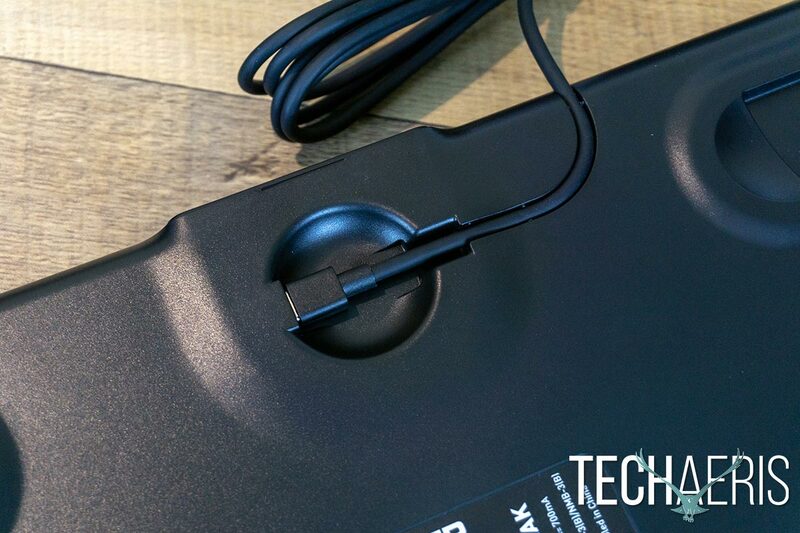 Flipping the keyboards over, you’ll find three elongated rubber feet along the front edge and two towards the back on the left and right sides of the keyboard. Also located in the upper back corners are a pair of adjustable feet which allow you to use the keyboard in one of two different heights. The bottoms of the feet are also rubberized for added grip. As alluded to above, the miniSTREAK also has a receptacle with a USB Type-C port to plug in the removable cable. The Fnatic miniSTREAK features a removable cable for easier transportation. Our review samples came with the U.K. keyboard layout and Cherry MX Brown mechanical switches. The keyboard is also available in a U.S. layout as well as with Cherry MX Red, Silent Red, or Blue switches depending on what you prefer. 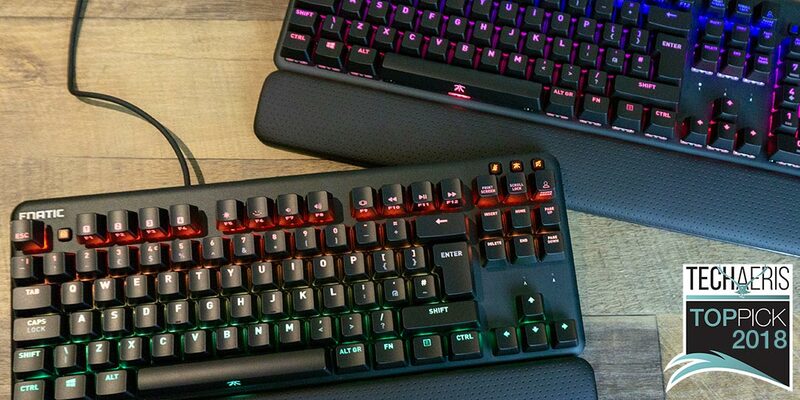 The Fnatic STREAK and miniSTREAK mechanical gaming keyboards can both be used out of the box, with no additional software required. Simply plug the USB cable into an available USB-A port (or two if you want to use the USB passthrough on the full-sized STREAK) and away you go. Pressing the Competition Mode key will disable the Windows Key, Lighting Configuration Mode, and Macro Recording Mode. Right side view of the Fnatic miniSTREAK. 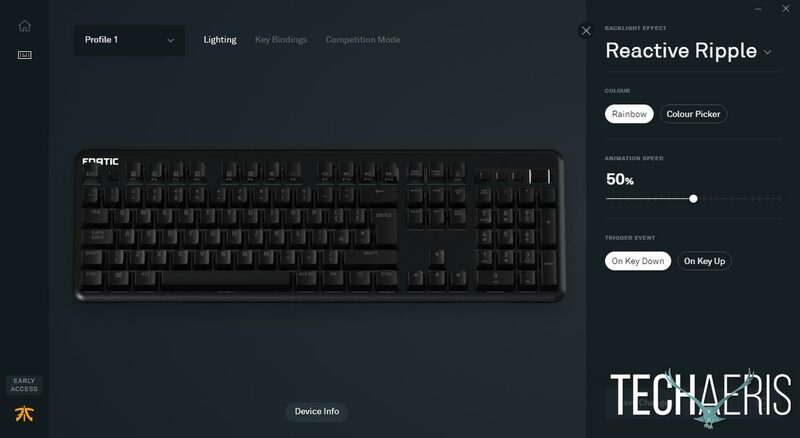 The Fn Lock key enables the Function key options without having to hold the Fn key down, switch between lighting modes by using Fn+F7 and the arrow keys, and adjust brightness levels between 0%, 25%, 50%, 75%, and 100% using Fn+F8. Recording macros takes a bit more work. Press and hold the Competition Mode key for 5 seconds until it starts blinking red to indicate recording has begun. Press the keys you wish to record as a macro then press the Competition Mode key again after which it will turn yellow. Once it’s yellow, press the key (F1-F6 on the STREAK or F1-F4 on the miniSTREAK) to save the macro to that key. Once you’ve assigned it to the key you want, press the Competition Mode key again and it will flash green to indicate the macro has been assigned to your desired key. Left side view of the Fnatic STREAK. Overall, the keyboards are fairly easy to use out of the box if you don’t want to install the Fnatic OP software. 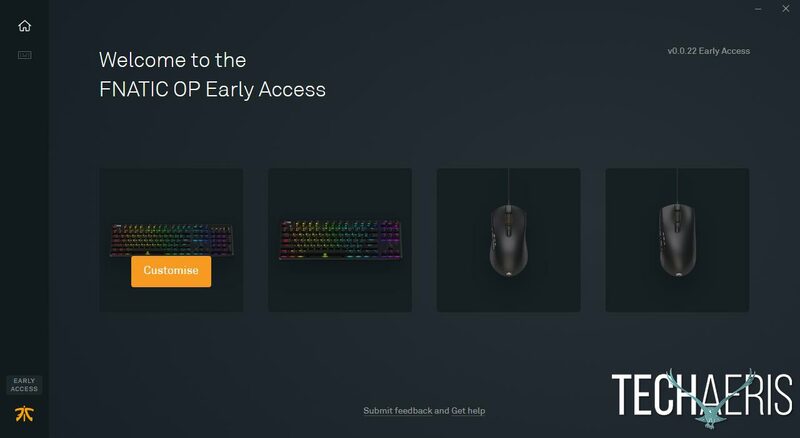 As with any decent mechanical keyboard, the Fnatic STREAK and miniSTREAK benefit from installing the Fnatic OP Early Access software. It has a pretty simple layout and, as far as the keyboards are concerned, is pretty simple to use. After installing the software and opening it, it will automatically update the firmware for your connected keyboard. The home screen shows an image of each Fnatic Gear Generation 2 peripheral. 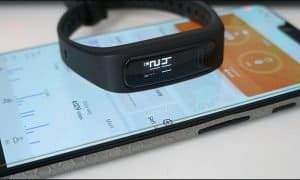 You can either click on your connected device (upon rolling over you’ll see Customise for a connected peripheral or Discover for one you don’t have) or the keyboard icon on the left hand side of the screen. Fnatic OP home screen screenshot. 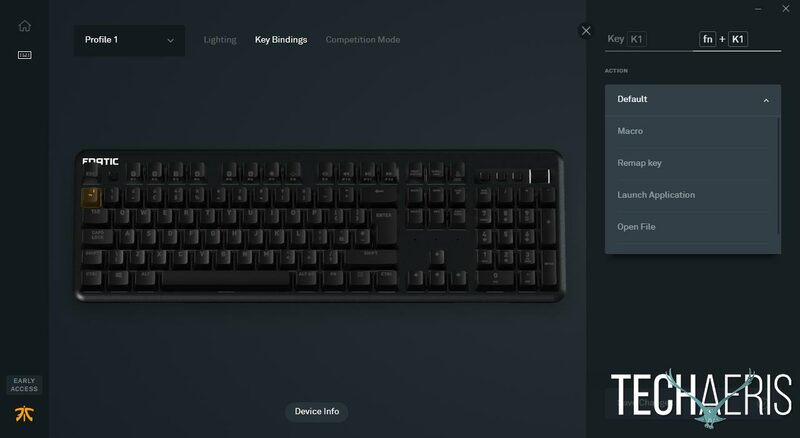 Once you’ve selected your keyboard, the main page shows a layout of the keyboard with a Profile drop-down menu in the upper left, with Lighting, Key Bindings, and Competition Mode tabs to the right. Choose which Profile — the keyboards can store up to four each — you want to edit, then select the appropriate tab depending on what you want to customize. Easily customize your lighting options. The Lighting section lets you choose between nine different lighting options and adjust between Rainbow or Colour Picker options to customize it to your desire. The Key Bindings section lets you re-bind any key on the keyboard. In addition, you can bind a macro, remap a key, use it to launch a specific application, or open a file to either the default key or a combination of Fn + that key. In other words, you can assign two different key binds to each key, vastly increasing the number of custom macros or remappings you can have per profile. The macro creation screen is a bit different than most I’ve seen but rather intuitive. Once you’ve recorded the macro, you can drag the duration to adjust the delay or time each key is pressed down. Assign macros, launch apps, open a file, or re-bind any key with the Fnatic OP software app. 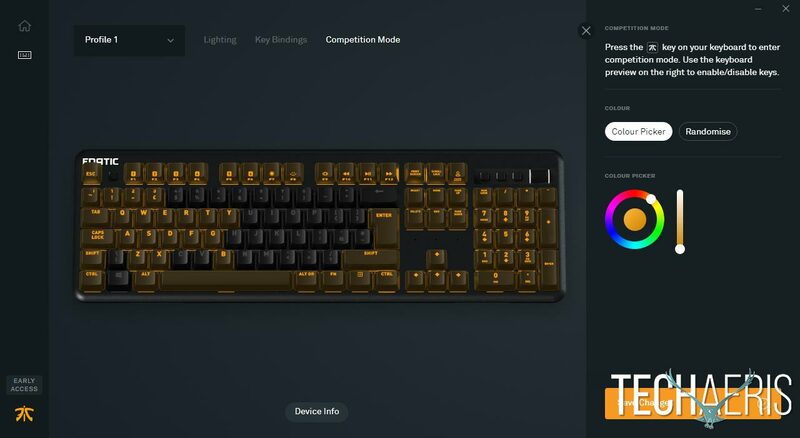 Finally, the Competition Mode allows you to select which keys should be disabled while entering competition mode, as well as the solid color you want on the keys that remain active. Competition Mode lets you disable specific keys to prevent accidental keystrokes while gaming. For an Early Preview version of the software, the Fnatic OP app is pretty straightforward, easy to use, and adds plenty of functionality to the keyboards. 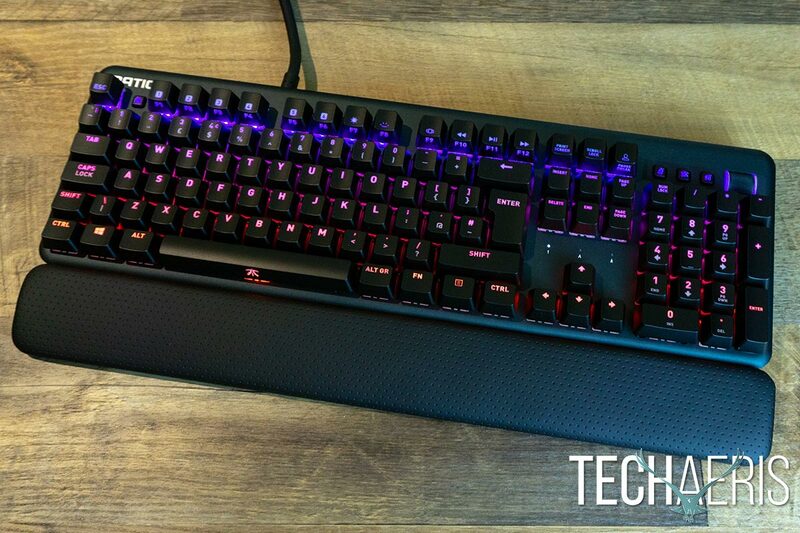 So the big question is, just how do these eSports-centric keyboards perform? To start off with, I’ve been reviewing a few different mechanical keyboards lately, all with different switches and it’s been awhile since I’ve used one with Cherry MX switches. Simply said, I forgot how much better they feel. Not to say others are bad, they feel and work fine, it’s just that the Cherry MX switches feel… smoother? 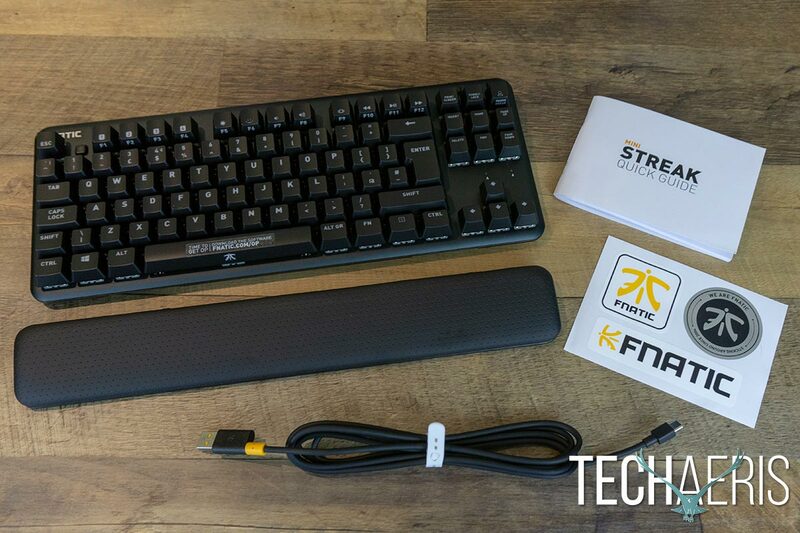 On that note, both the Fnatic miniSTREAK and STREAK keyboards are very responsive, and definitely a treat to use not only while gaming but also for everyday computer tasks. I had no issues with missed or delayed keystrokes and, as mentioned, the Cherry MX switches are exactly what you’d expect from the company. The Fnatic STREAK has an MSRP of $129.99USD/€129.99 while the miniSTREAK comes in at $99.99USD/€99.99. 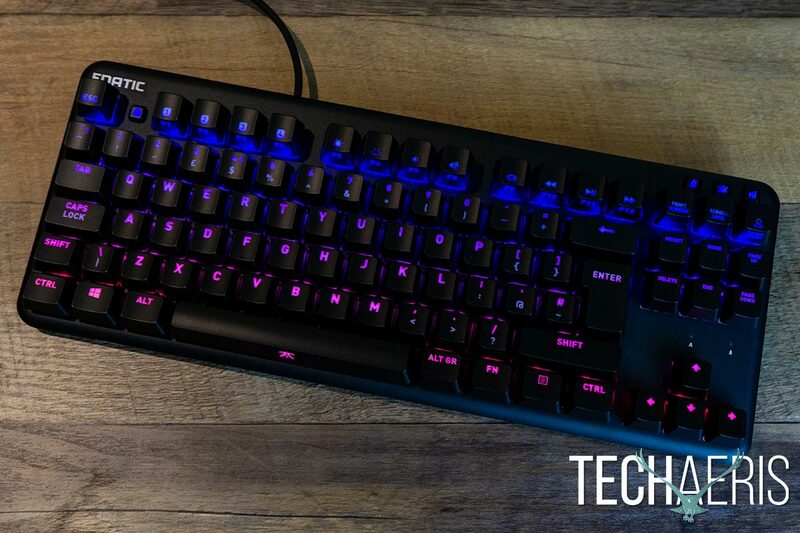 Given the build quality, performance, included wrist rest, and the fact they use Cherry MX mechanical switches, these mechanical gaming keyboards offer great value for any gamer looking for a quality gaming keyboard. On that note, while I do like the tenkeyless form factor, the extra $30 for the number pad and USB passthrough is definitely worth it, especially if you are planning on using the keyboard for more than just gaming. Adjustable feet have rubber grips on the bottom as well for a solid grip while gaming. 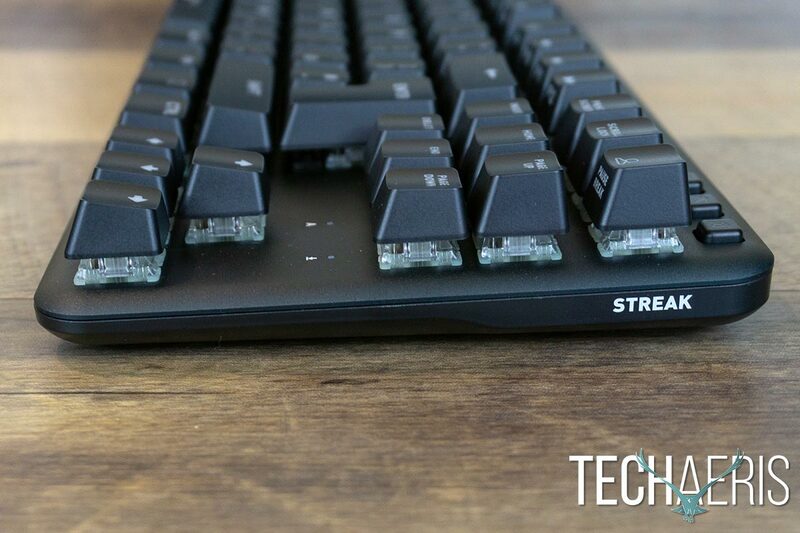 Depending on your keyboard weapon of choice, the Fnatic STREAK and miniSTREAK mechanical gaming keyboards offer great performance and value with their Cherry MX switch choice selections. 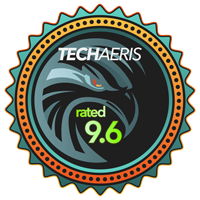 As a result, they are more than worthy of a Top Pick of 2018 Award here at Techaeris. 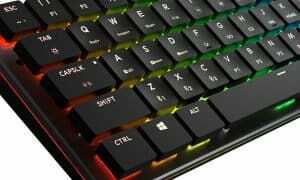 *We were sent a sample of the Fnatic miniSTREAK and STREAK mechanical gaming keyboards for the purposes of this review.